Peruvian beans are also known as Frijoles Perunos / Mayocoba or Canary beans. 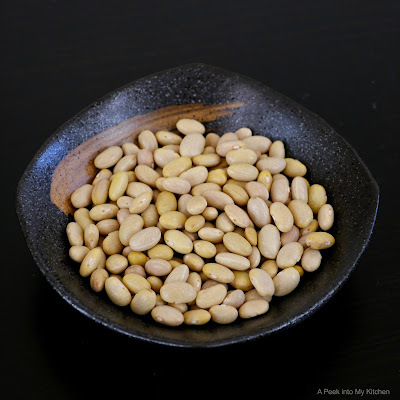 They are oval shaped, pale yellow, dry beans with delicious buttery taste and texture. Pressure cook the soaked beans for 3 whistles or until soft. Heat oil in a skillet and splutter mustard seeds. Add urad dal and red chilies. Fry until golden brown. Add asafoetida, radish, turmeric powder, and curry leaves. Sprinkle little water, cover, and cook over low heat until soft. 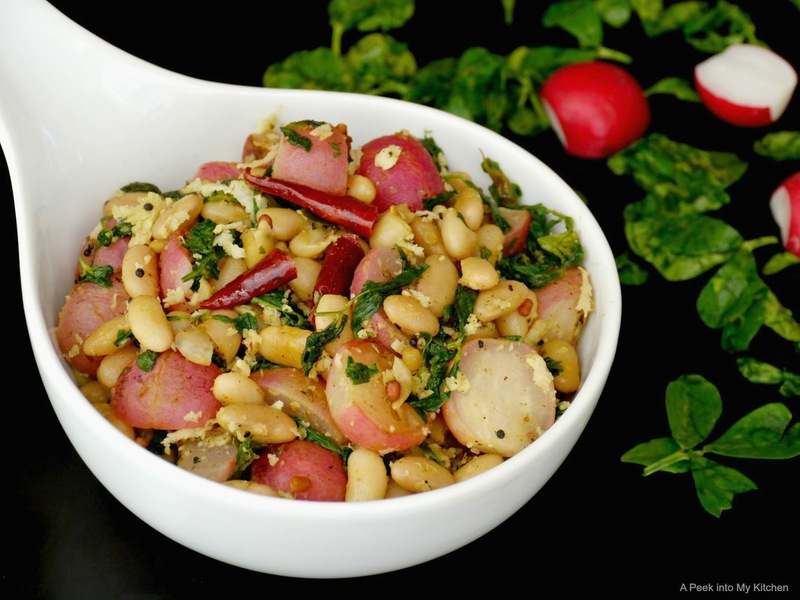 Add the cooked beans, fenugreek leaves (or any greens), pepper powder, cumin powder, and salt. Mix well. Saute for 3 to 5 minutes. Remove from heat and add the grated coconut. Stir to combine. Serve hot as a side dish for any rice dish or simply like a salad. This spicy, tangy and lip-smacking gravy is one of the authentic and traditional dish of Tambram household. 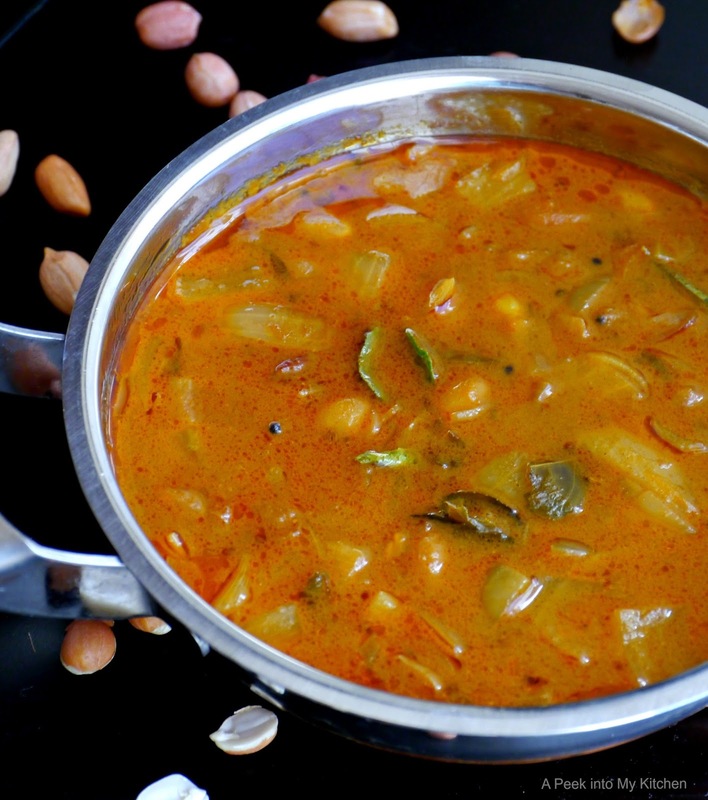 Onions cooked in tamarind gravy along with roasted peanuts and spices. 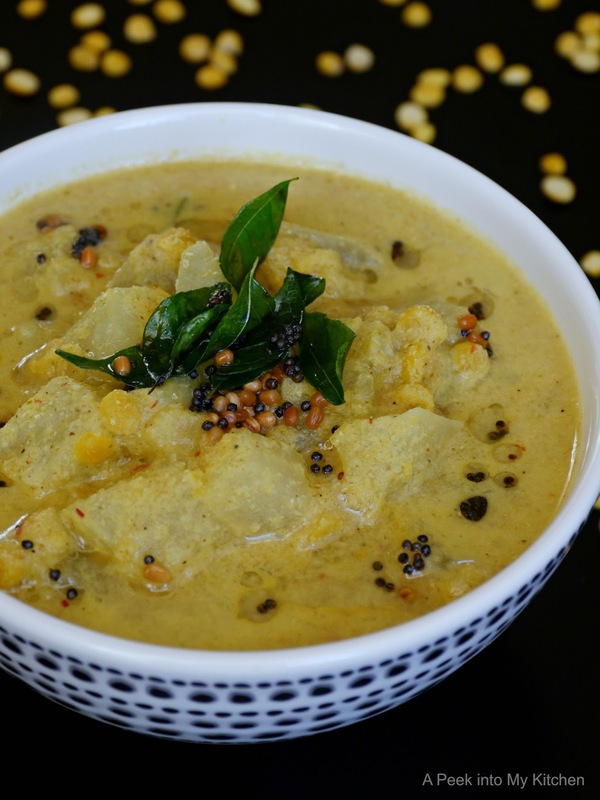 It is best paired with paruppu thogayal (toor dal chutney) or Keerai masiyal (mashed spinach) and sutta appalam (toasted papad). Heat oil in a wide bottomed saucepan. Splutter mustard seeds. Add ajwain /omam, fenugreek seeds and peanuts. Fry until peanuts are roasted, about 2 minutes. Add curry leaves, asafoetida and onions. Fry the onions until soft and translucent. Add the sambar powder, red chili powder, and turmeric powder. Saute for 30 seconds, over low heat. Add the tamarind juice along with 2 cups of water, jaggery, and salt. Mix well and let it boil for 20 minutes, over medium low heat, until gravy thickens. Gravy should be of a pouring consistency. Remove from the heat and drizzle some sesame oil for extra flavor. Add some more chopped curry leaves. 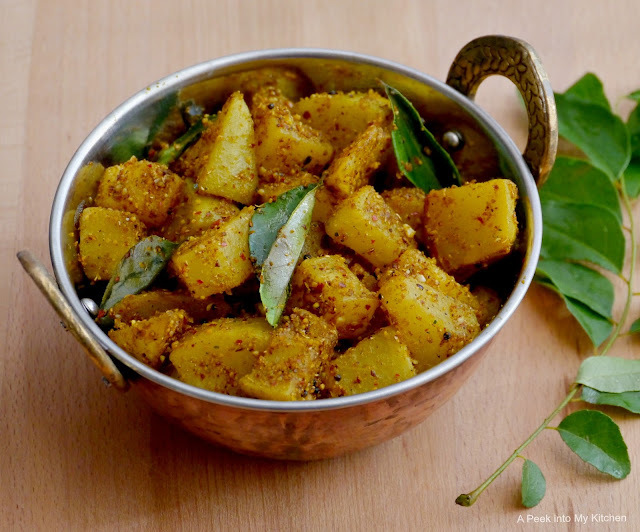 Serve with hot steamed rice, drizzled with ghee or sesame oil and sutta appalam / toasted papad. 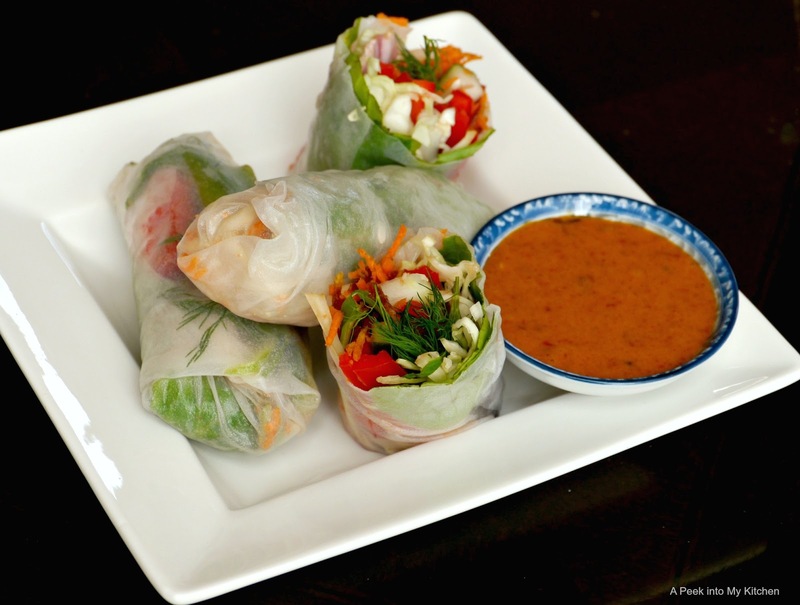 Spring rolls or summer rolls are very light and refreshing and make a wonderful appetizer, lunch or dinner. 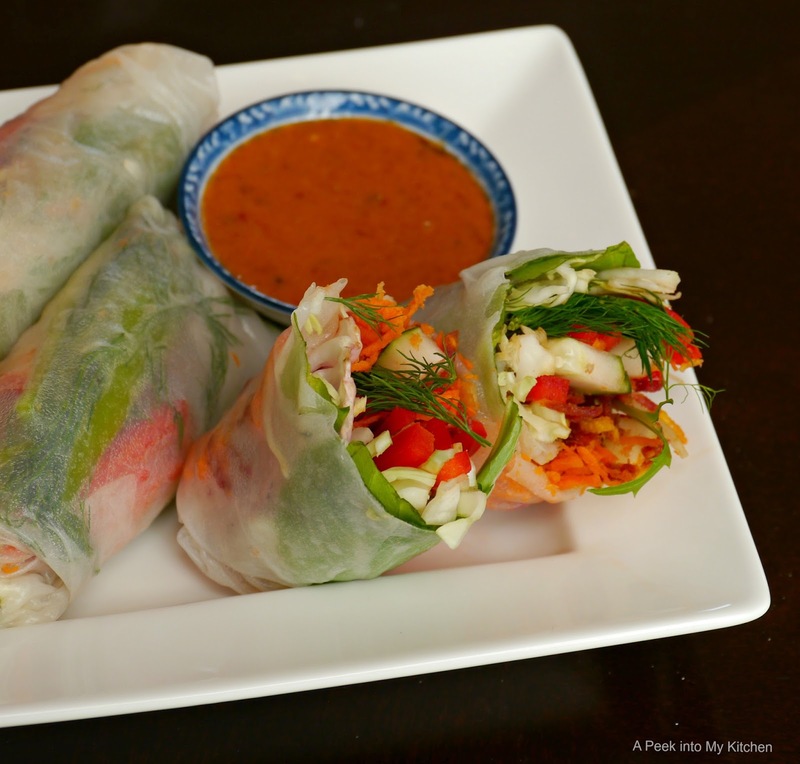 Except for the chopping of the vegetables, these spring rolls are quite easy to make and very versatile. In a mixing bowl, whisk together all the ingredients for the sauce until smooth and creamy. If the sauce is too thick, thin it out with water. Set it aside. Fill a large bowl with warm water. Dip and rotate the rice paper in water for 2 seconds. If soaked too long, the paper will break. Place the rice paper on a plate and start assembling the veggies from the bottom 1/3 of rice paper closet to you. Start with some herbs and top it with vegetables. Do not over stuff. Start rolling: wrap the bottom edge of the paper over the veggies and tuck it in. Next wrap the sides carefully and start rolling towards the top, gently and tightly. Finish with rest of the papers. Serve with spicy peanut sauce. Combine all the ingredients (except oil), in a dry non-plastic dishware. Heat sesame oil in a small skillet until slightly smoky. Pour the oil over apple mixture. Mix well, cover and let it rest for 15 to 30 minutes. 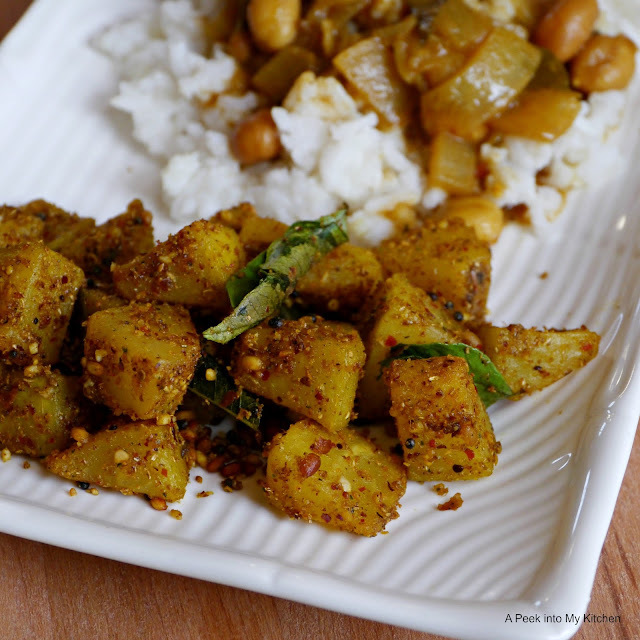 Serve with any type of Indian food as a spicy accompaniment. My choice is always with thayir sadam / yogurt rice. Craving for biriyani? 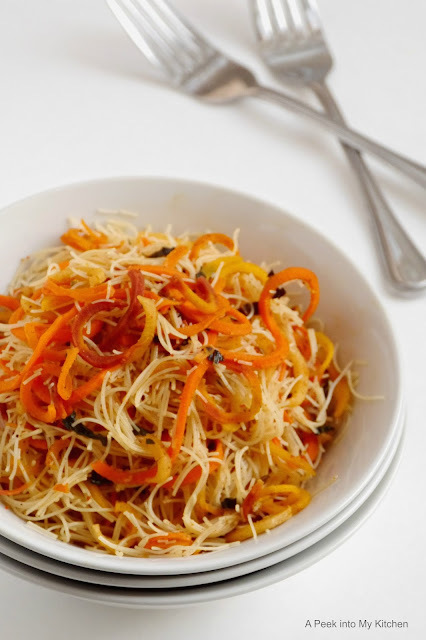 Here is a guilt-free, healthy and delicious noodles bursting with aromatic biriyani flavor. Feel free to add any vegetables that you would use for a regular biriyani. Soak rice noodles in hot water for 5 minutes. Drain. 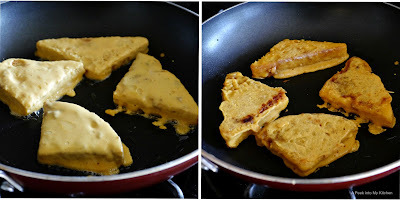 Heat oil or ghee in a skillet. Splutter fennel seeds. Add the biriyani masala and saute for 10 seconds over low heat. Add the carrots and salt. Saute for 2 minutes. Add the cooked noodles and mint leaves. Mix well to combine. In a small skillet, saute the poha in ghee until heated through. Set it aside. Boil milk in a saucepan. Simmer for 10 minutes, stirring often, until slightly reduced. Add poha and cook until soft. Add the sugar and cook for another 10 minutes to thicken (a semi porridge consistency). 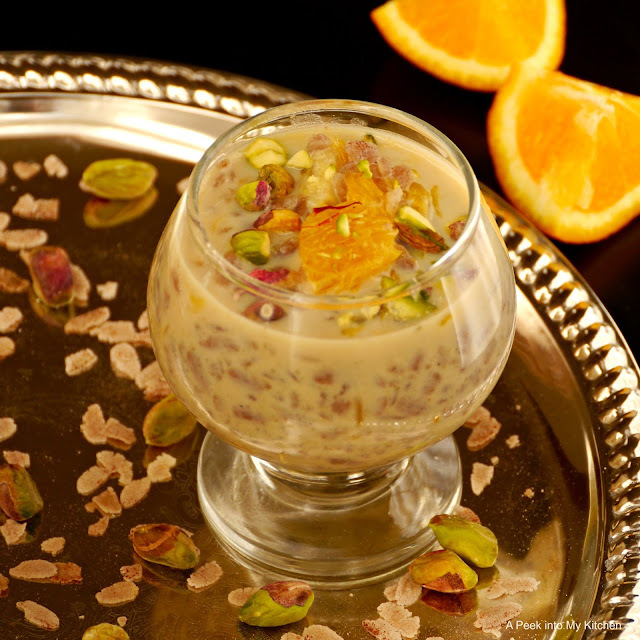 If the kheer is too thick, add more lukewarm milk. Add cardamom powder and saffron strands. Mix well. Cool completely. Once cooled, add the chopped oranges. Chill before serving. Garnish with chopped nuts and serve. Combine all the ingredients in a large mixing bowl. Check for seasoning. 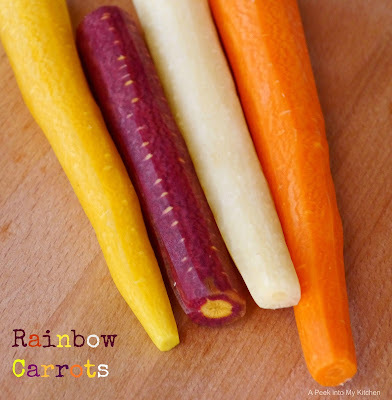 Refrigerate at least 15 minutes for the flavors to mingle. 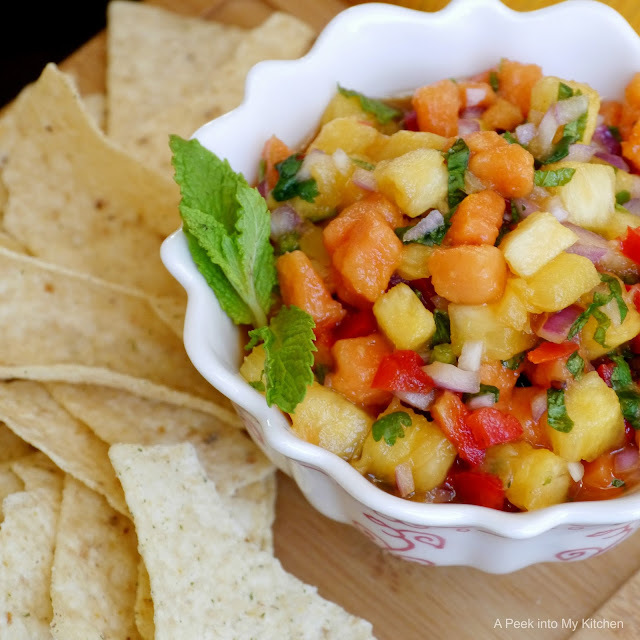 Serve chilled salsa with tortilla chips or tacos. 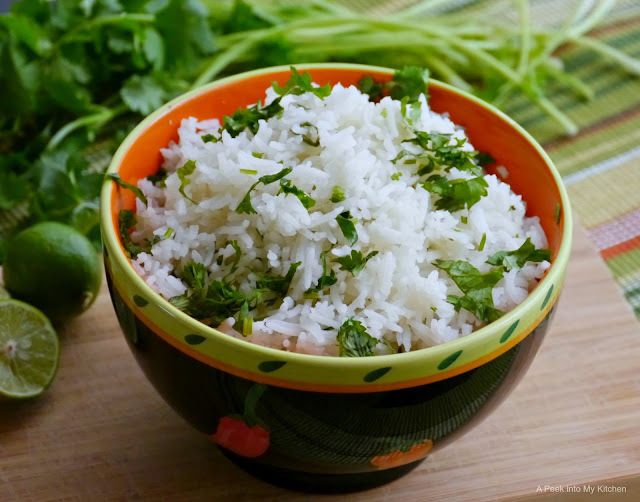 Here is an incredibly easy to make Chipotle style, cilantro lime rice recipe. 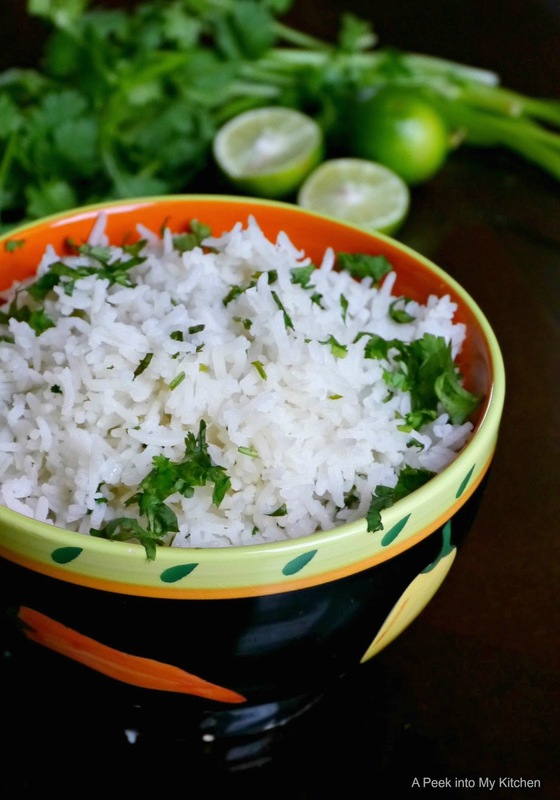 This delicious and refreshing rice is a great addition to tacos, burritos, and wraps. This rice can also be served, as a side dish to any Mexican food. In a large saucepan, add butter, bay leaf and rice. Saute for 2 minutes, stirring constantly, over medium - low heat. Add 2 cups of water and salt. Let it come to a boil. Cover and simmer for 15 minutes or until the water is absorbed. Remove from the heat. Add the lime juice, cilantro and 1 tbsp butter. Mix gently with a fork. 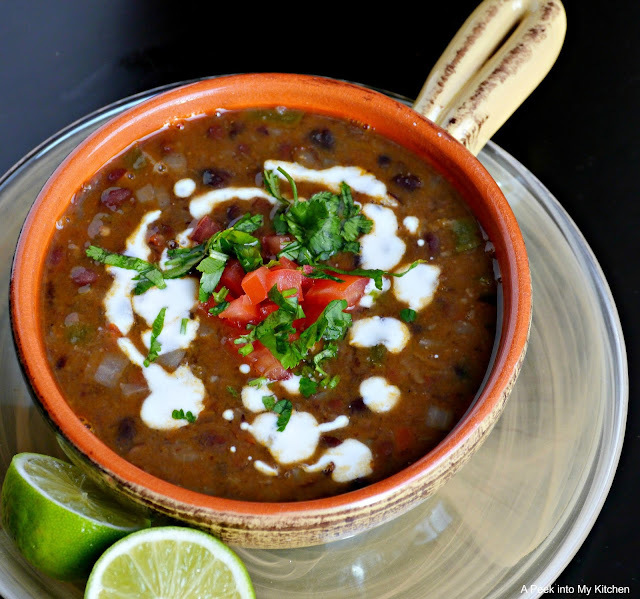 Serve with tacos, burritos or any Mexican food. 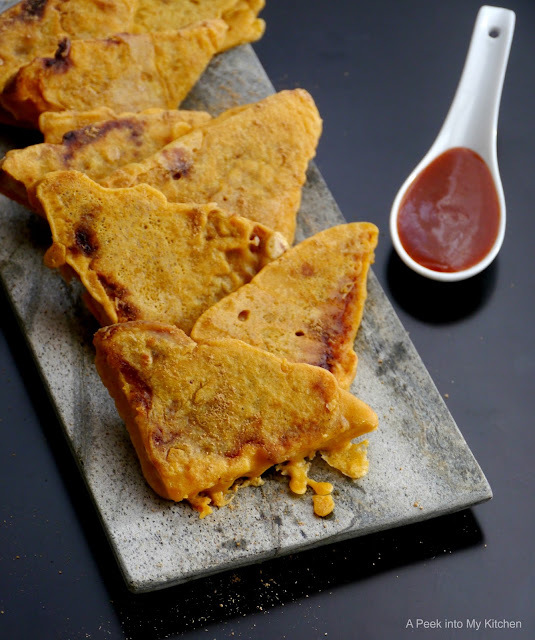 Enjoy this quick and delicious, guilt-free bajjis whenever you crave for a deep fried snack. Sift all the ingredients for the batter in a mixing bowl. Add water little at a time and make a batter which is in flowing consistency and can easily coat the bread. Cut the bread into 4 triangles. Spread green chutney on one side and sweet chutney on the other side of the bread slices. Heat 1 tbsp oil in skillet. 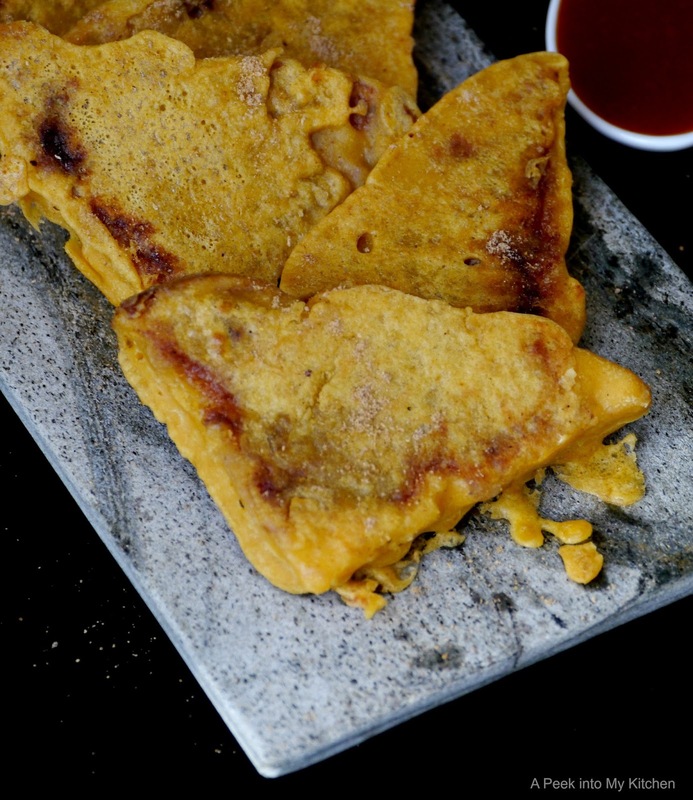 Dip the bread slices into the batter one at a time and place it on the hot skillet. Drizzle some more oil around the bread slices. Cook over medium heat until bottom of the bread slices are golden brown. Flip and cook on the other side. When both sides are cooked thoroughly, remove from the heat. Repeat the process with rest of the bread slices. Sprinkle with chat masala. Serve hot with ketchup or any spicy dip. Steam cook the cubed papaya until fork tender. Heat oil in a skillet. Splutter mustard seeds. Add urad dal and fry until golden brown. Add asafoetida and curry leaves. Add the steamed papaya, turmeric powder and salt. Stir to combine. Add the curry powder and mix well to coat. Cook over low heat for 2 minutes, stirring often. Serve hot. Best served as a side dish for sambar, rasam or yogurt rice. I was browsing through Pinterest and this recipe caught my eye. I quickly went through the recipe and sure enough, I had all the needed ingredients and immediately started making it. 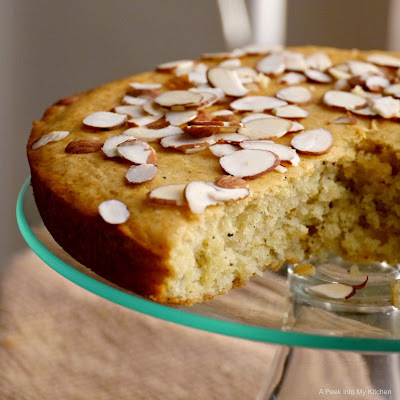 It is a simple, mildly sweet cake infused with rich and aromatic flavors of saffron and cardamom. Can any dessert go wrong with this flavor combination? Try and see. Preheat oven to 350 degrees F. Grease and cake pan and set it aside. Add cardamom and saffron to milk and keep it aside. In a mixing bowl, sift flour, baking powder, baking soda, corn starch, and salt. In another mixing bowl, beat yogurt, sugar, saffron milk, butter, and oil until sugar dissolves. Add the flour mixture to the wet ingredients and stir gently. Do not mix more than 10 - 15 seconds. Pour the mixture in a greased pan. 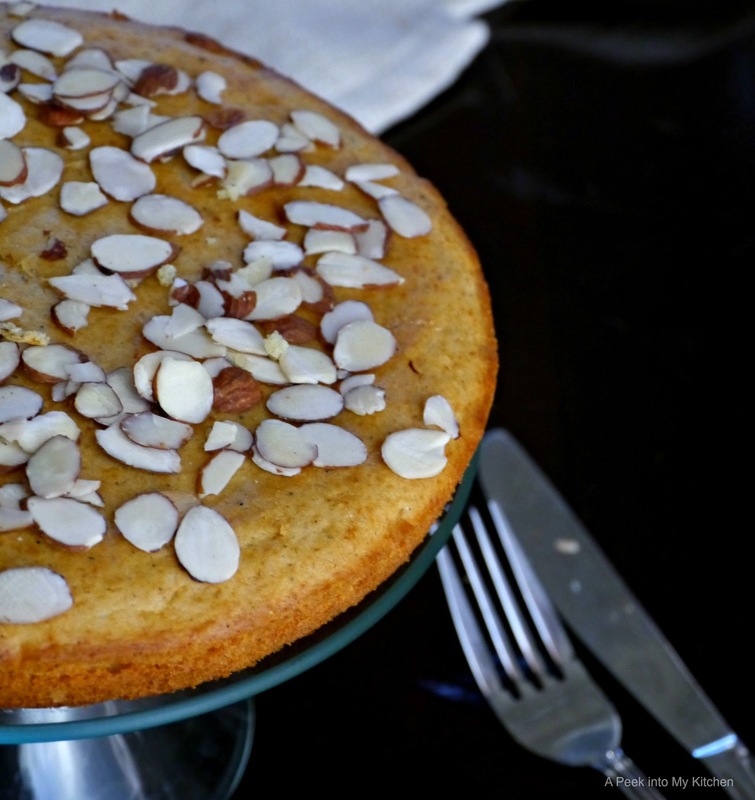 Bake for 30 to 40 minutes or until a toothpick inserted in the center of the cake comes out clean. It took 30 minutes in my oven. Garnish with your choice of chopped nuts. 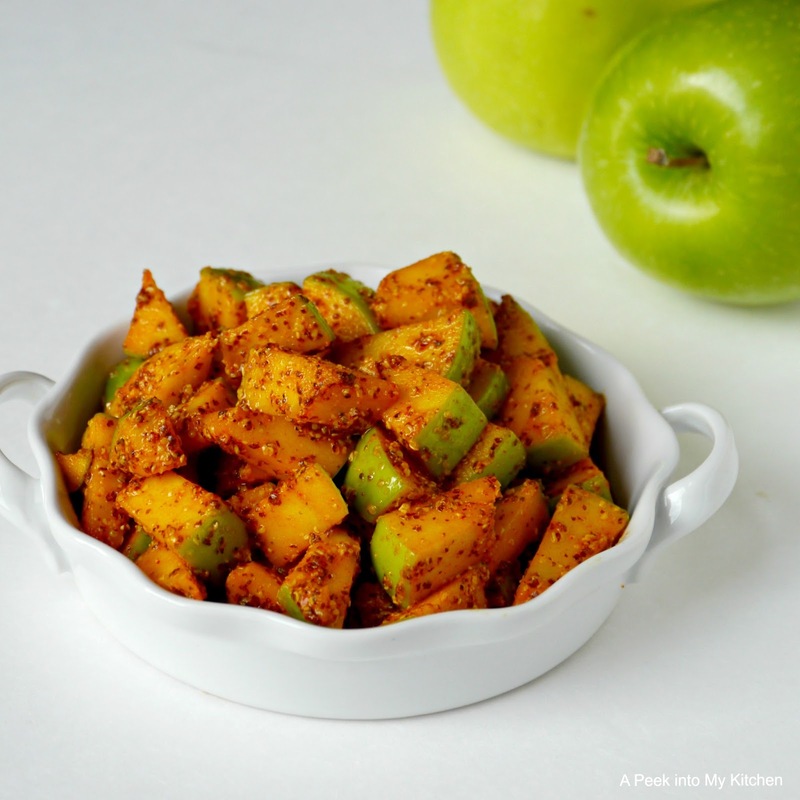 A quick, simple yet delicious stew / kootu made with winter melon, also known as ash gourd or white pumpkin. Gram / chana dal / yellow lentil is added for protein along with lightly spiced ground coconut. Wash and soak the chana dal in water for 1/2 hour. 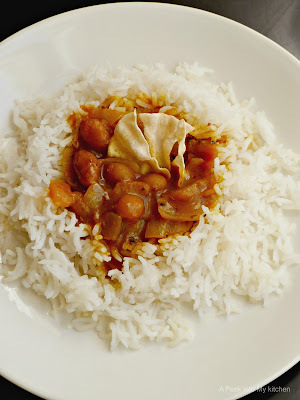 Cook the dal until soft, on a stove top or in a pressure cooker. Grind the ingredients in the "to grind" list into a coarse paste. Place the melon in a saucepan and add to just cover the melon. 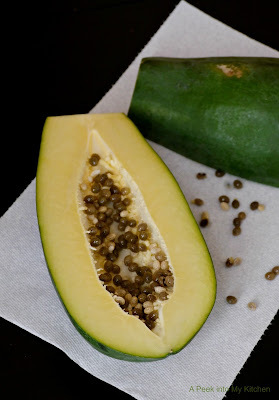 Cook over medium heat until the melons are tender and translucent. Add turmeric powder and the cooked dal. Bring it to a boil. Add the ground paste and salt. Stir and cook for 2 minutes over low heat. Serve hot with steamed rice or quinoa. A soft, flaky, refreshing flat bread seasoned with dried pomegranate and mango powder. Grind peas, mint, green chilies, and ginger into a coarse paste. In mixing bowl, combine flour, anardana powder (dried pomegranate), mango powder, chat masala, salt, 2 tbsp oil, and the ground paste. Mix well. Add water little at a time and make a soft dough. Knead the dough for 5 minutes. The dough can also be made in the kitchen aid stand mixer. Cover and rest the dough for 30 minutes. Combine oil and ghee in a small bowl. Divide the dough into 10 equal balls. Dust the dough ball in flour and roll into a thin disc using a rolling pin. Brush about 1/2 tsp oil and ghee mixture. Sprinkle flour all over. Gather one end of the disc and start making folds like a fan / pleat till the other end. Roll from one end to another end to make a ball. Flatten and roll into a thin disc, dusting with flour as needed. Heat a cast iron skillet / tawa and place the rolled out disc and cook on medium heat, until bubbles appear. Flip, apply oil/ghee to the cooked side. Once the other side is cooked, apply oil/ ghee again. Toast until both sides are nicely cooked with brown spots. Remove from the skillet. Once all the parathas are cooked, gently loosen the layers by pressing the sides of the parathas. Serve hot with yogurt, pickle, or curry of your choice. This healthy, low-fat, highly nutritious, and protein packed soup is extremely comforting and delicious. Loaded with amazing flavors, this soup is very versatile and can be served as a curry / dal with rice and naan as well. Heat oil in a sauce pan. Add the onions, ginger and garlic. Saute until soft. Add the green pepper and jalapeno pepper and saute for 30 seconds. Add the tomato, cumin powder, chili powder, and garam masala powder. Saute for 2 minutes. Add the black beans and salt along with 3 cups of water. Mix well. Take about 2 tbsp beans with the water and grind to a smooth paste. Add it to the soup and bring it to a boil. Simmer and cook for 15 minutes. Remove from the heat and sprinkle chat masala and lemon juice. Garnish with fresh coriander / cilantro leaves. 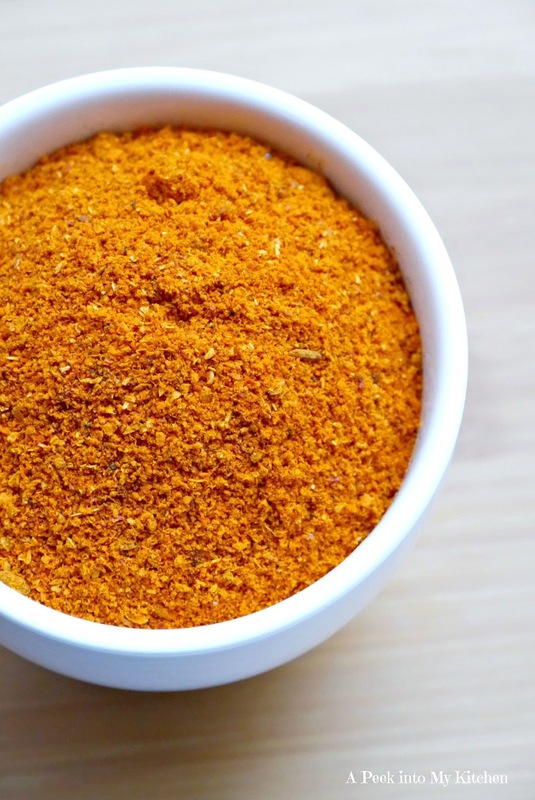 A spicy and aromatic powder used to make the famous Karnataka dish called Bisebelabath. Bisibelabath is a mix of rice, lentil and vegetables cooked in tamarind juice and seasoned with this spice blend. 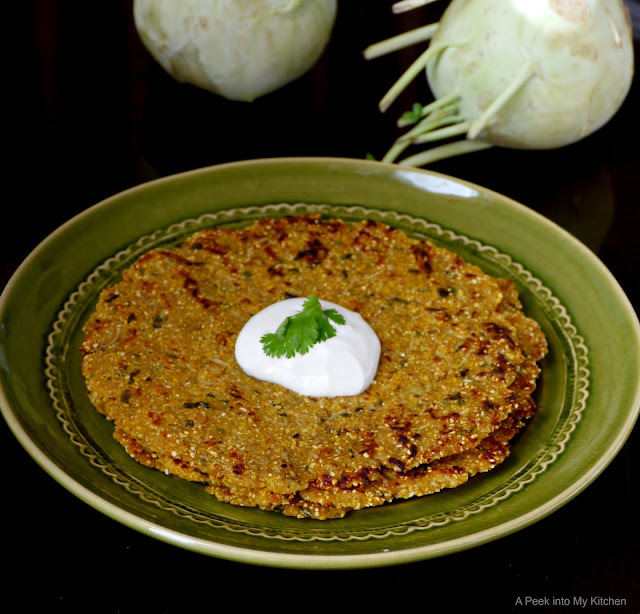 Roast the chana dal and urad dal in a small skillet till golden brown. Transfer into a bowl. 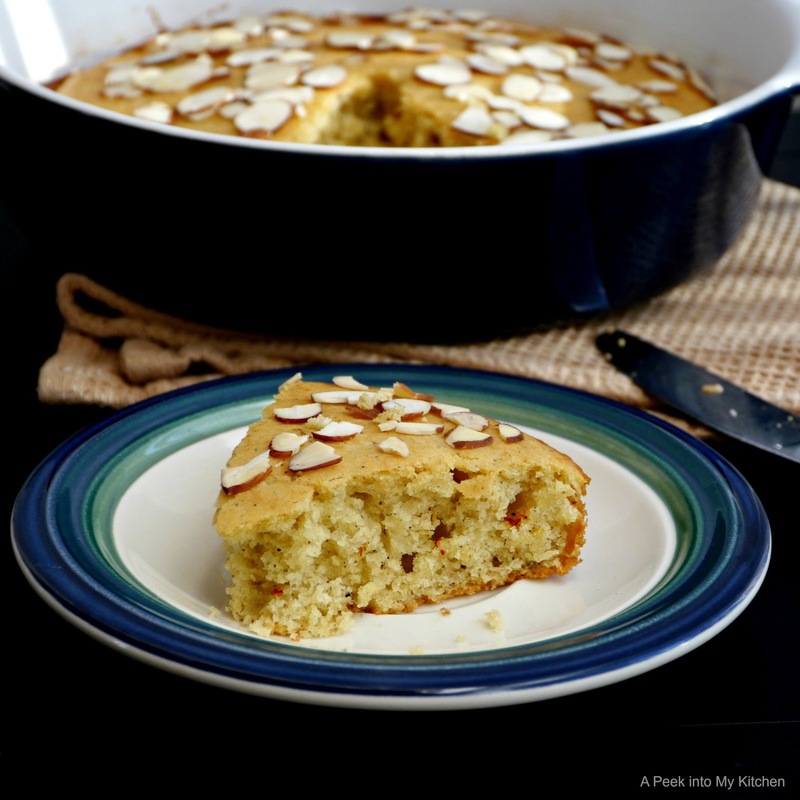 Heat ghee in a small skillet. Add the desiccated coconut and fry till golden brown over low heat. Transfer it into a bowl. Heat 1 tsp ghee in the same skillet and roast rest of the ingredients over low heat until aromatic, about 1 to 2 minutes. Let it cool completely. 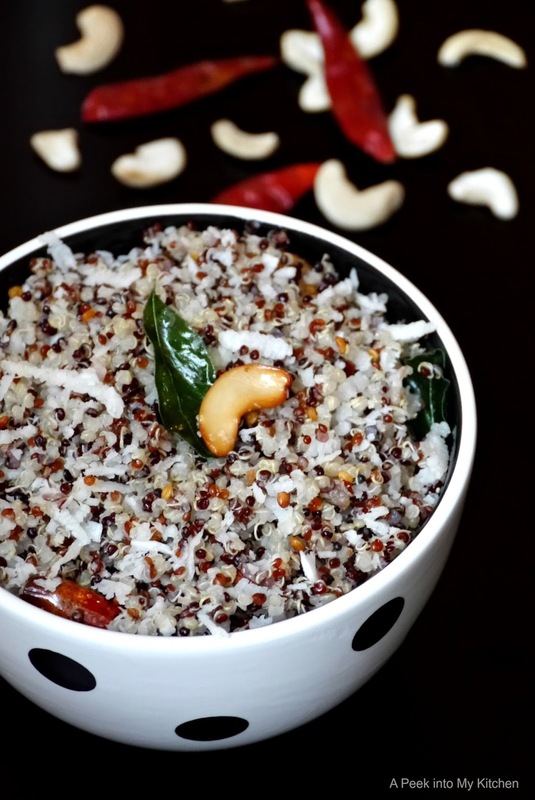 Grind into fine powder along with chana dal, urad dal and coconut. Use immediately. If not, store in the refrigerator for later use. 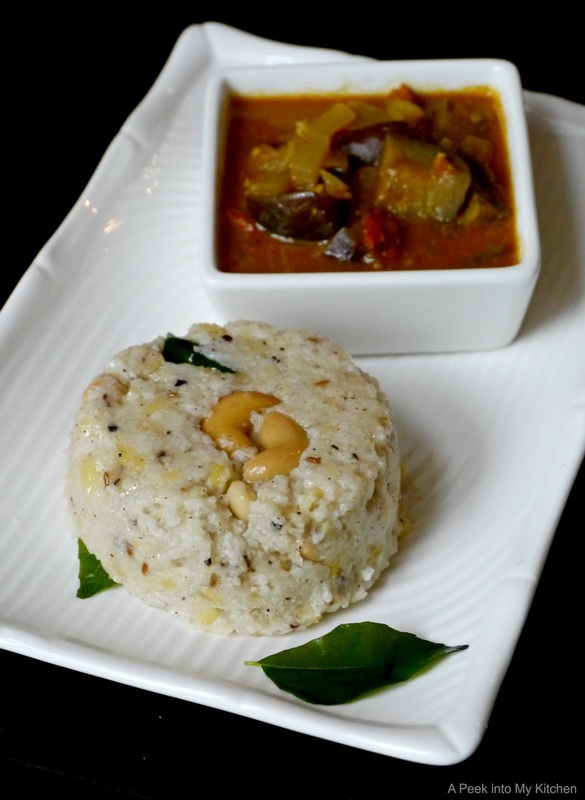 Here is a healthy and nutritious alternative to a traditional South Indian coconut rice. Rinse the quinoa well and drain. Cook quinoa with 2 cups of water in a pressure cooker for 3 whistles. For the stove top method, bring water to a boil in a sauce pan. Add quinoa, stir, cover and cook for 15 minutes or until all the water has been absorbed. Let it stand covered for 5 minutes and fluff gently with a fork. Heat oil in a skillet. Splutter mustard seeds. Add urad dal, red chillies, cashews, curry leaves, and asafoetida. Fry until golden brown over low heat. 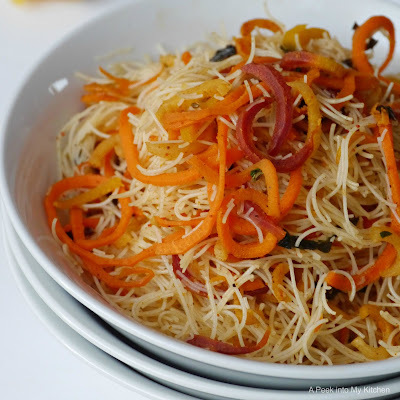 Add the grated coconut and saute for 2 to 3 minutes. Turn off the heat. Add the cooked quinoa and salt. Mix well. Serve with any spicy gravy, papad or chips. This is a simple, delicious and healthy way to replace pasta when you are counting calories and carbs. 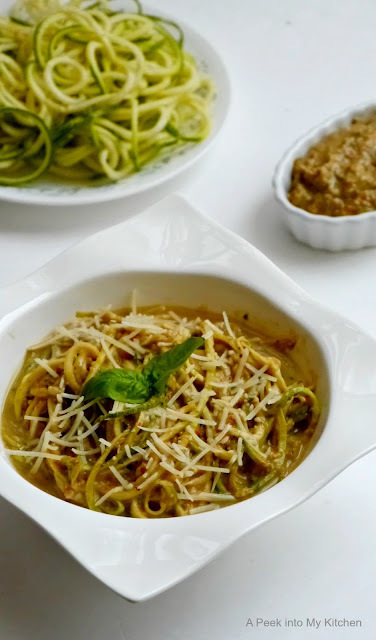 Zucchini noodles or zoodles are made with a spiralizer, a popular gadget that transforms vegetables and fruits into spirals like thick and thin spaghetti, or ribbons. It is so easy to use and the noodles are ready in less than five minutes. With many different options from table top to handheld spiralizers, Paderno and Veggeti Pro brands are more popular slicers in the market. Even if you don't own this lovely gadget, it is quite simple to make these spirals. Just use the vegetable peeler, peel thick slices out of zucchini or any vegetable, stack them together and cut into thin noodles. Rub oil over red peppers and place them on a baking tray. Bake for 15 minutes or until the peppers are charred on both sides, turning once. Let it cool and peel the skin. 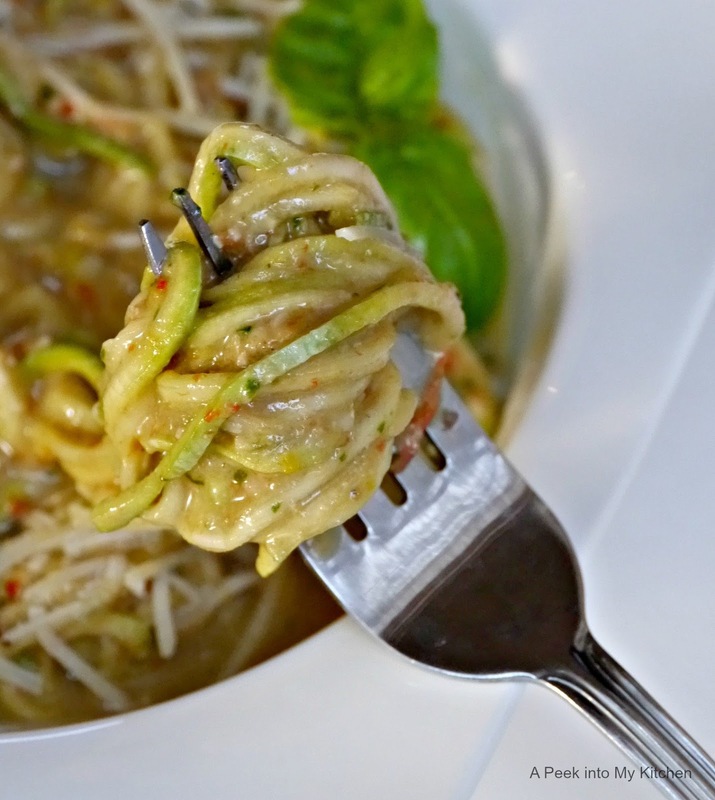 Using a spiralizer, cut the ends of the zucchini and make spirals. In a food processor, place the nuts and process until coarse. Add the remaining ingredients for the pesto along with the roasted red pepper and process until smooth. Heat 1 tbsp olive oil in a skillet. Add the chopped garlic and saute for 10 seconds. Add the zucchini noodles and saute for 30 seconds. Add desired amount of pesto and toss well. Season with more cheese, salt and pepper. Serve hot. Saamai, also known as Litle Millet, is an another gluten-free millet variety which is high in nutrients, protein and fiber. This Saamai pongal is a healthy alternative for regular rice pongal and tastes exactly like rice pongal, in fact even better. 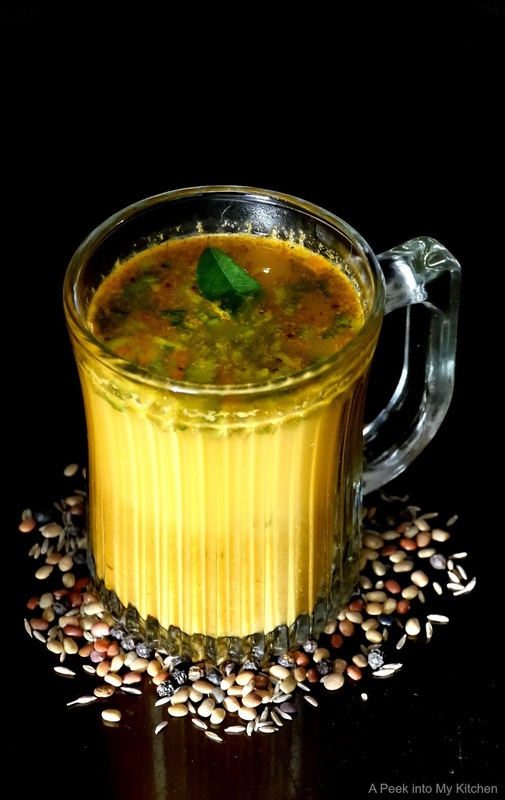 Wash little millet and moong dal together and add 3 and 1/2 cups water. Pressure cook for 5 whistles. Crush the black pepper and cumin to a coarse powder. Heat 2 tbsp ghee / clarified butter in a small skillet. Add cashews and fry until light golden brown. Add the ginger, black pepper cumin power and curry leaves. Fry for 10 seconds. Add the mixture to the pongal along with salt. Mix thoroughly. 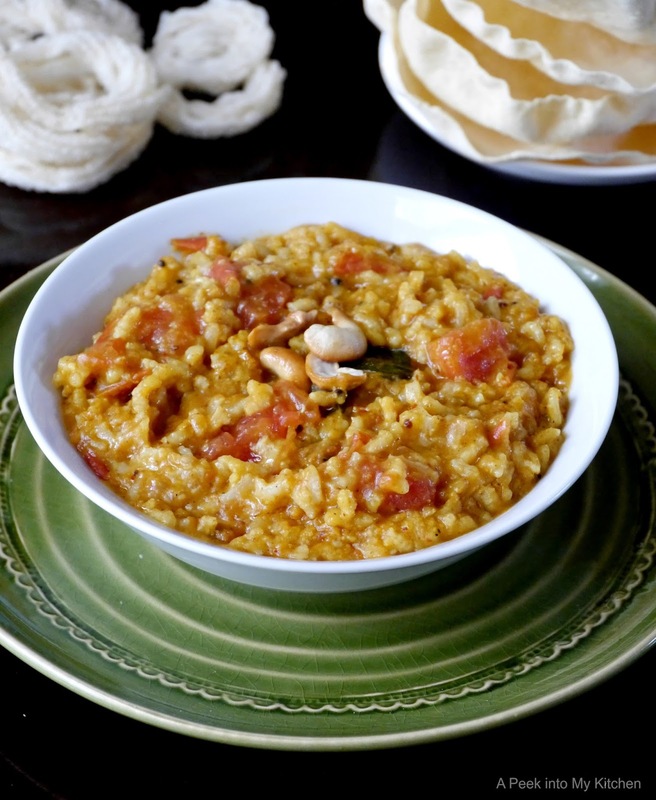 If the pongal is too thick, add hot water to loosen. 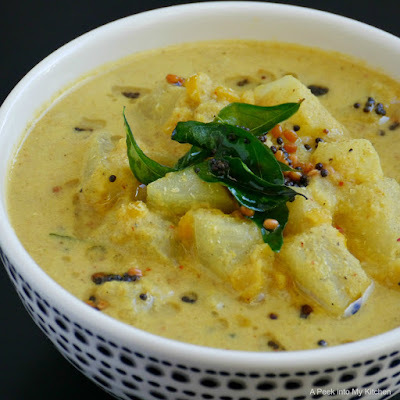 Serve hot with gothsu, sambar or chutney. 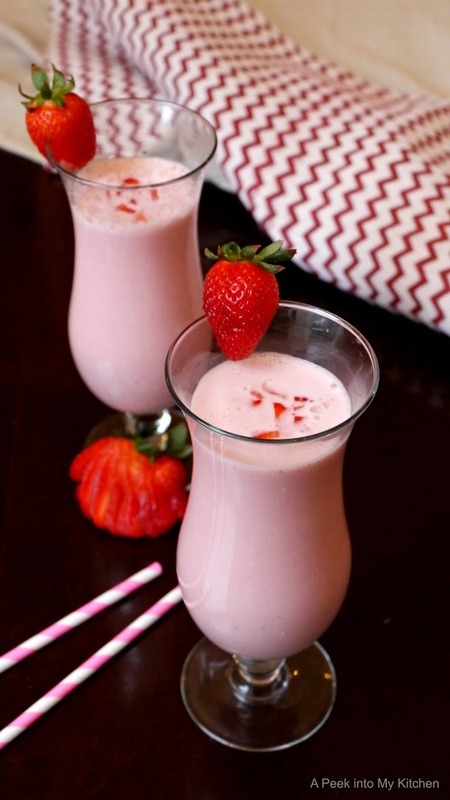 A sweet, creamy and refreshing yogurt drink made with strawberries instead of mangoes, which is often used in this drink. This simple drink takes hardly anytime to whip up and it is absolutely delicious. I have not added any extra ingredients like cardamom and rose water. If you wish, feel free to use it. Place all the ingredients in a blender or vita-mix. Blend until smooth and frothy. Taste, and adjust the sweetness. 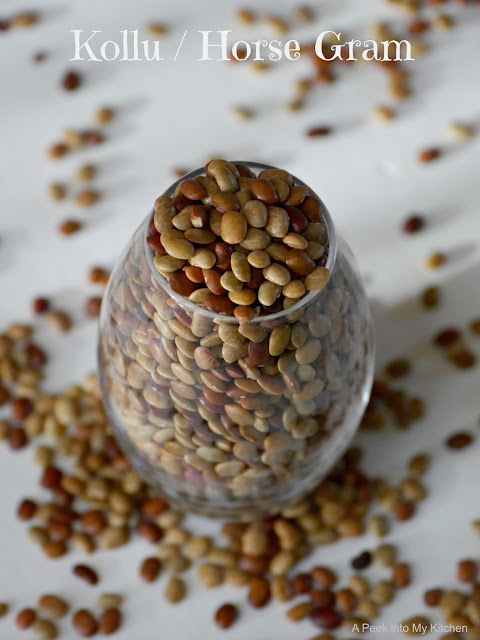 Horse gram is a high protein, low fat, nutrient rich, ancient legume widely consumed in India. It has plenty of medicinal properties. It is called Kulthi in Hindi, Ulavulu in Telugu, Hurule in Kannada and Mudhira in Malayam. 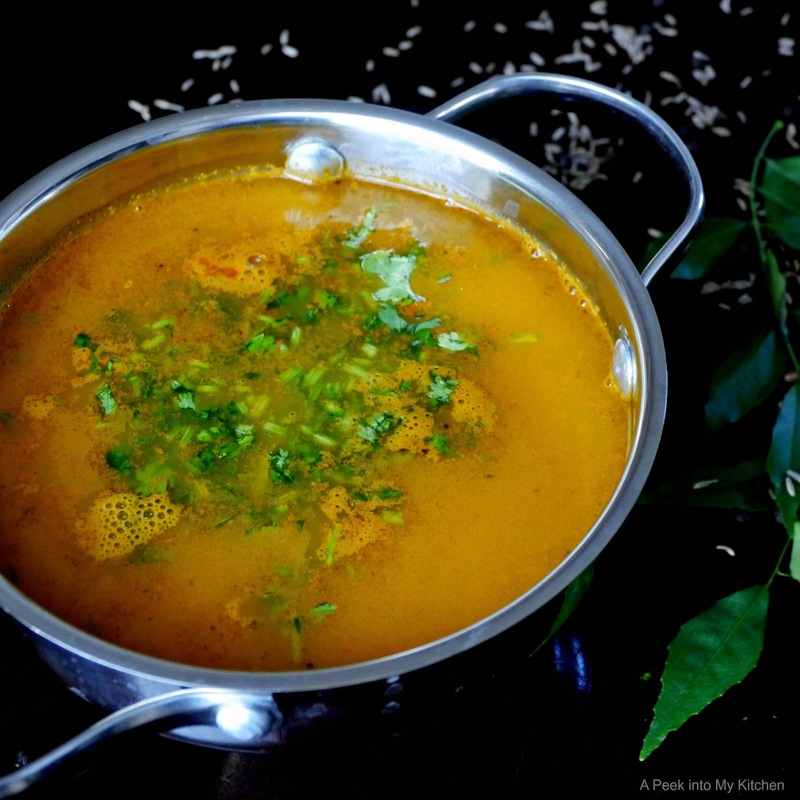 This healthy kollu rasam / soup is an excellent remedy for a common cold and cough. Clean the horse gram by picking the impurities (there will be some small stones). Wash and soak the dal in hot water for 2 hours and pressure cook with enough water for 8 to 10 whistles. You can also cook the dal without soaking. You may have to cook it for some extra whistles. Meanwhile, heat 1 tsp ghee in a small skillet. Add garlic, peppercorns, cumin seeds, red chilies, and some curry leaves. Fry for 10 seconds. Add the tomatoes and turmeric powder. Cook until soft. 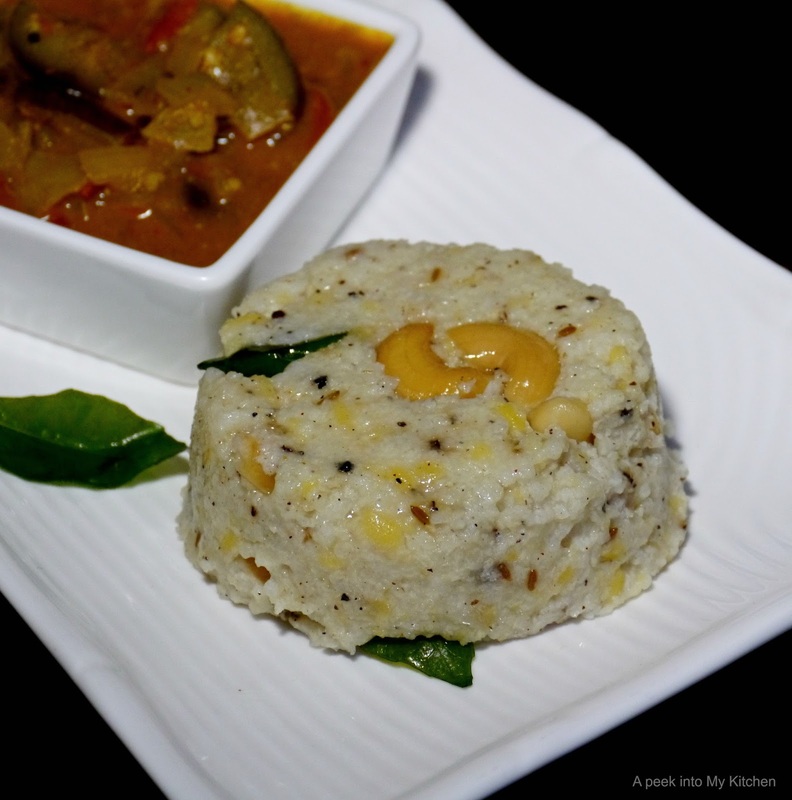 Let cool and grind to a smooth paste along with cooked dal and dal water. In a large sauce pan, combine tamarind paste or tamarind juice and 1 cup of water. Boil for 5 minutes. Add the ground paste, salt and 3 cups of water. Bring it to a boil and simmer for 7 to 8 minutes. Heat 1 tsp ghee in a small skillet and splutter mustard seeds and some curry leaves. Add it to the rasam / soup and mix well. Serve with hot steamed rice or as a soup. 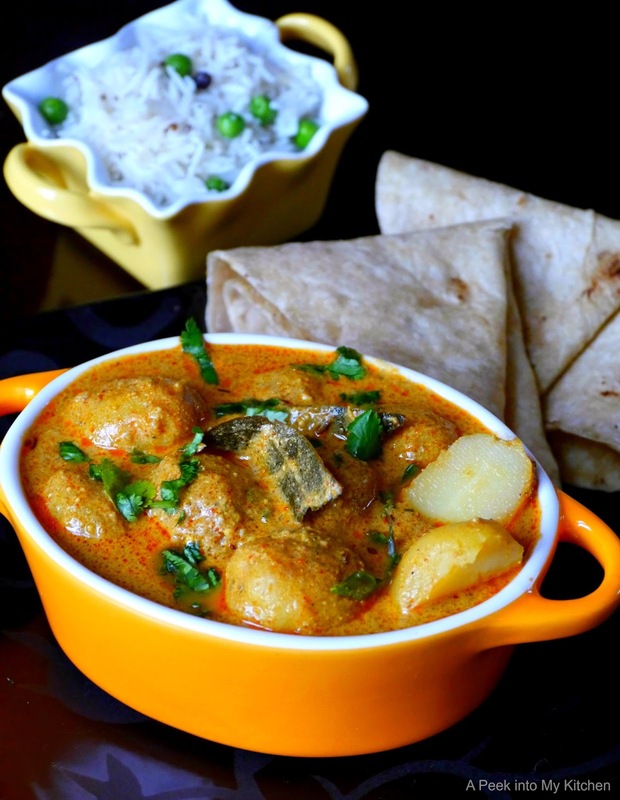 In this tangy, aromatic, creamy and traditional Kashmiri dish, the potatoes are deep fried in oil and then added to the yogurt gravy. Since I wanted to cut down on some calories, I chose to bake the potatoes. Nevertheless, it turned out one amazingly flavorful and delicious curry. Wash and boil the potatoes in enough water until soft. Peel the potatoes and prick them all around with a tooth pick or fork. Place the potatoes in a baking tray lined with aluminum foil. Bake the potatoes until golden brown on both sides, about 20 minutes. Alternatively, you can fry the potatoes in hot oil for more rich and authentic flavor. In a small bowl, combine fennel powder, coriander powder, ginger powder, kashmiri chili powder, and turmeric powder in 1/4 cup water. Heat oil and ghee in deep skillet. Add asafoetida, cumin seeds, bay leaf, cardamom, cloves and cinnamon stick. Fry for 20 seconds. Add the spice mixture and fry over low heat until oil separates. Add the yogurt, sugar and salt along with 3 cups of water. Mix well. Add the potatoes, cover and cook over low heat for 20 minutes, stirring occasionally. Uncover, add the garam masala powder, mix well and cook for a minute. 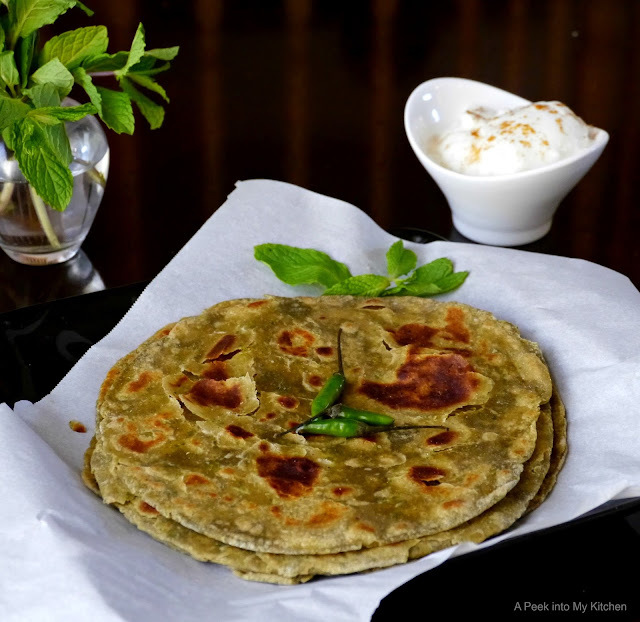 Remove and garnish with coriander leaves. 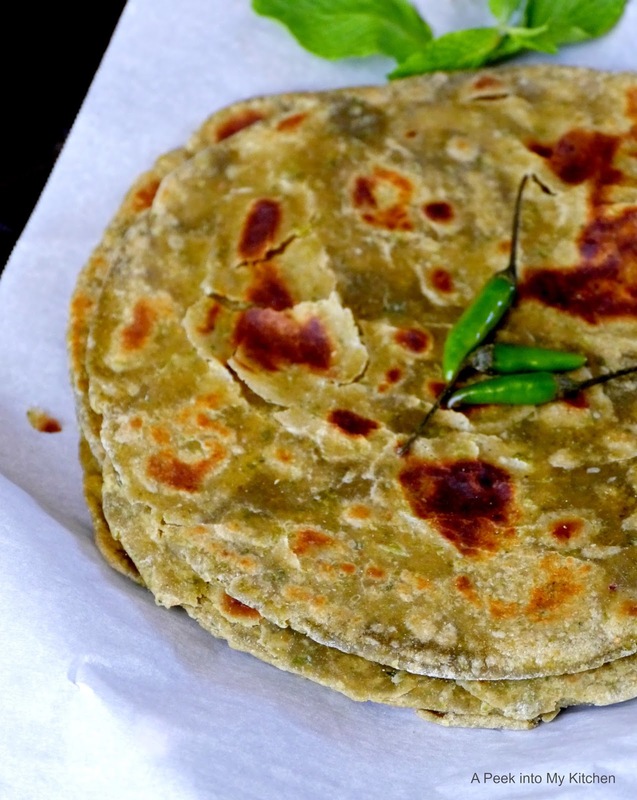 Serve with naan, roti, chapati or rice. 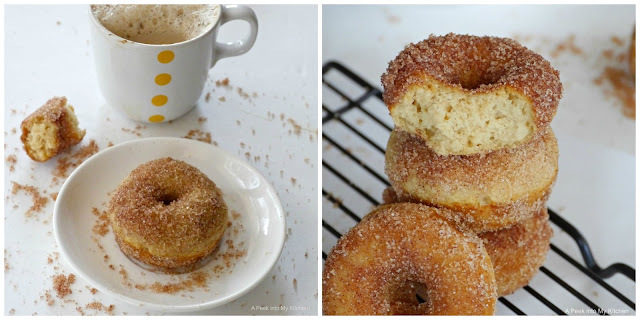 These soft, delicious, cinnamon-sugar coated Snickerdoodle donuts are so easy to make and are incredibly addictive. This is way healthier than the fried donuts. My fussy tween gave a thumps up after trying it and that's a good thing. You can get the donut pan from amazon or at a local Home Goods, TJ Maxx or Ross for Less Stores. I got mine from TJ Maxx for $7.99. Preheat oven to 350 degrees F. Grease the donut pan and set it aside. In a mixing bowl, combine the flour, brown sugar, baking soda, baking powder, and salt. In a another mixing bowl, whisk together the corn starch mixture or egg (if using), yogurt, vegetable oil, milk, and vanilla extract. Pour the wet mixture to the dry ingredients and mix until just combined. The mixture will be thick. Spoon the batter into a large ziplock bag and cut a 1/2 inch hole in the corner. Pipe the batter into the donut molds, filling 3/4 of the mold. Or simply spoon the batter directly into the mold. Bake for 10 minutes. Allow it cool in the pan for 5 minutes before dusting with cinnamon sugar. Combine sugar and ground cinnamon in a bowl. 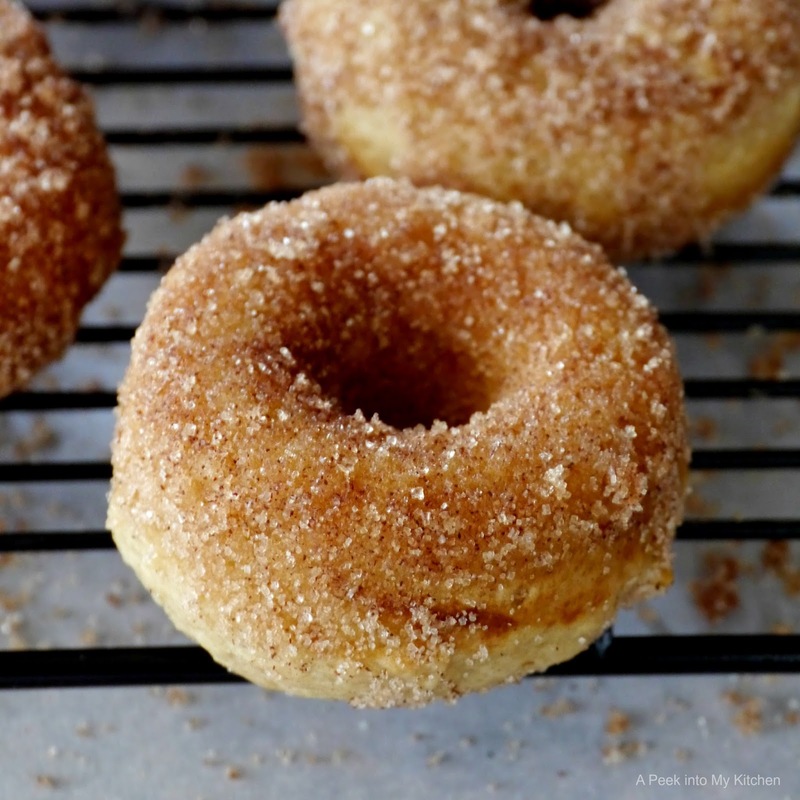 Using a small brush, brush each donut with the melted butter on both sides. Dip each side into the sugar mixture. Cook the rice and toor dal with 6 cups of water in a pressure cooker for 4 to 5 whistles. Meanwhile, heat 1/2 tsp oil in a small skillet and roast all the ingredients in the to roast list except coconut, until golden brown. Let it cool and grind into a smooth paste along with coconut. Heat 2 tbsp oil in a wide pan or kadai. Splutter mustard seeds. Add the curry leaves and asafoetida. Add the chopped tomatoes and turmeric powder. Saute for 1 minute over medium heat. Add the ground masala paste and salt. Cook for 2 minutes over low heat. Add cooked rice to the tomato mixture. Stir to combine. Heat 1 tsp ghee in a skillet. Roast the cashews and add it to the rice. Mix well. 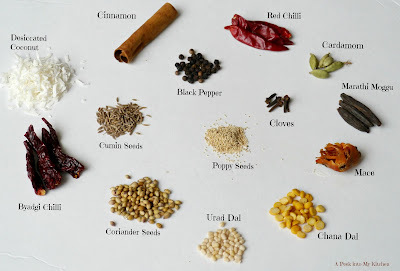 Serve hot with chips / appalam / papad or vadam. 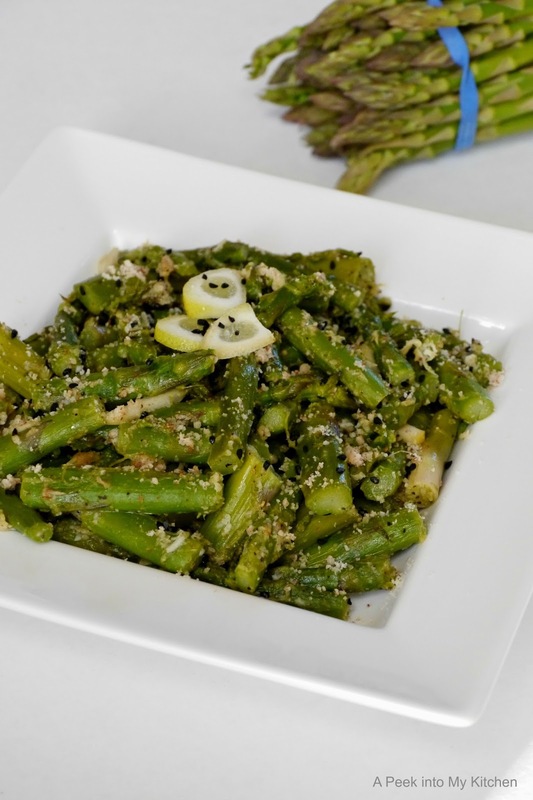 A quick, healthy, low calorie, nutrient rich Asparagus stir-fry flavored with lemon and ginger. 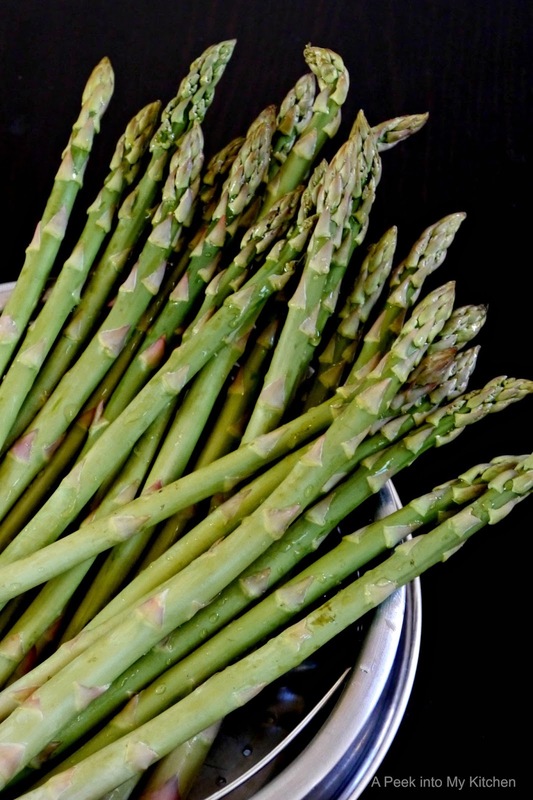 Steam cook the cut asparagus for 3 to 5 minutes or until tender. Heat oil in a skillet. Add nigella seeds and grated ginger. Saute for 10 seconds. Add the steamed asparagus, lemon zest and salt. Gently saute for a minute. Remove from the heat. Add the lemon juice and ground almond powder and stir well.